Finances of Higher Education Institutions 2011/12 shows that the surplus of net income over expenditure for UK higher education institutions (HEIs) fell by 6.4% to £1.1 billion in 2011/12 from a high of £1.2 billion in 2010/11. 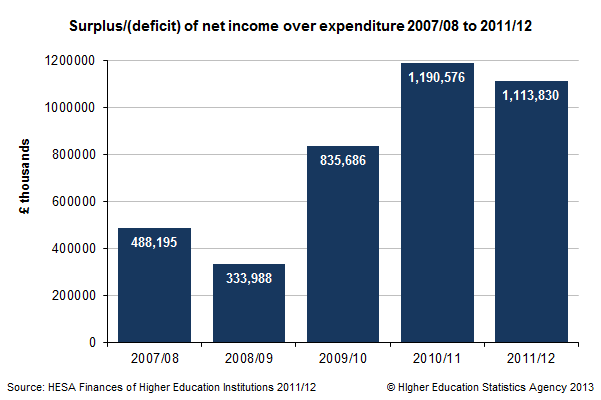 The chart below shows the HE sector’s surplus/deficit for each of the last five years. These are cash figures to which no deflator has been applied. Chart 1 in the online introduction to Finances of Higher Education Institutions 2011/12 shows the same information for the last ten years. The income, expenditure and surplus/deficit of each UK HEI for 2011/12 and 2010/11 can be found in Table 1 of Finances of Higher Education Institutions 2011/12. Table C from the online introduction to the publication aggregates income and expenditure figures for institutions funded by each of the four UK countries’ funding councils. All four countries reported a surplus for the year 2011/12 but only Northern Ireland showed an increase as a percentage of net income on the previous years. The chart below illustrates change in surplus as a percentage of net income over the last three years. Finances of Higher Education Institutions 2011/12 is a downloadable publication which contains 12 tables of income and expenditure data at institution, regional and national level from the HESA Finance Statistics Return. Finances of Higher Education Institutions 2011/12 is available to purchase now. Further financial statistics from the HE Business and Community Interaction Survey will be published on 23 May 2013. A full schedule of all HESA releases for 2013 can be found here. HESA Finance data is collected from all publicly funded Higher Education Institutions (HEIs) in the UK, plus the University of Buckingham, which is a non-publicly-funded institution. 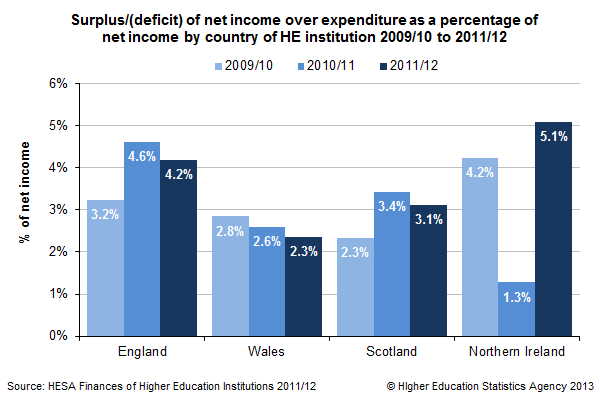 The 2011/12 data covers 163 HEIs (130 in England, 11 in Wales, 18 in Scotland and 4 in Northern Ireland). Financial data relates to the HEIs' financial year, i.e. 1 August 2011 to 31 July 2012. Data for the years 2007/08 to 2010/11 are based on restated figures supplied in the subsequent year. Net income is total income less any share of income from joint venture(s). Full definitions for the publication can be found on-line here.